After a long time designing and testing – the time has finally come to reveal the new MBS range launching in September. This is a complete overhaul including new decks, new trucks, new bindings, new hubs and new tyres. The RockStar II hubs remain, as do T1, T2, T3 and Roadie tyres. A few people saw a sneak peak at the beginning of the year at ISPO in Munich – it has come a long way from then though. First up the Pro 97 – the Dylan Warren pro model. This is the longest board in the range, perfect for powerful riders looking for the toughest equipment. The 97cm deck offers a compromise between the old 95 and 100 – it features the world’s first asymmetric concave profile which is ergonomically crafted to fit your foot with the low-point of the concave being directly under the ball of your foot. A PBT finish ensures this deck will take some abuse! The deck is paired with Matrix II Pro trucks. It’s been a while since a truck innovation this significant has come to town and MBS is proud to be in the driver’s seat. It’s lighter, it’s stronger, and the new MBS ShockBlock suspension will let you push the envelope of speed with more stability than ever before. The Pro version features hollowed out axles to reduce weight. The new F5 bindings are designed to offer ultimate comfort thanks to their improved fit. The double ladder strap system allows them to fit smaller feet and lower profile footwear with ease letting you have total control of the board. The board is finished off with black RockStar Pro hubs and T1 tyres – a classic combo built for speed and capable of taking big landings. The Comp 95 is our workhorse! A versatile board capable of hitting any kind of terrain. This has always been one of our most popular models. It has now been updated with a new deck featuring our asymmetric concaves to help keep your feet locked into the board and give you maximum control. The board also features new Matrix II trucks – giving a stable and controlled ride! F5 bindings allow you to get the perfect fit to your shoes with the double ratchet system. The package is finished off with our bombproof RockStar II hubs and T3 tyres. The Comp 95X takes the same deck, trucks and bindings as the Comp 95 then a V5 brake kit, 9″ T2 tyres and our new lightweight FiveStar hubs (replacing the Tri-Spoke). This is our freeride set up – capable of tackling rougher terrain and narrow trails. It is hugely popular in mountains and forests worldwide. The Core 94 is a new model in the range which combines the old Core 90 and 95. The Core 94 features a new blunted deck shape and takes advantage of some major component upgrades. First up the bindings are now our new F5 bindings – which are super adjustable thanks to the dual ladder straps. Next up the ATS.12 trucks – our classic all terrain skate truck, but with stronger 12mm axles (up from 9.5mm) and a powder coated finish. The board is finished with new FiveStar hubs and T3 tyres. Our entry level board the Colt 90 also gets the new blunted deck shape as well as some component upgrades. The biggest upgrade is without doubt the wheels. FiveStar hubs and T1 tyres give the Colt a lot more performance and are considerably lighter. The second major upgrade is the move to ATS.12 trucks which are stronger and more durable. This also comes with a bearing upgrade which means the whole range now uses a single spec bearing. Finally the F1 bindings have been updated. The Colt 90X features the same spec as the Colt 90 but with the addition of our V3 brake system make this the perfect board for recreational riding and getting into more freeride type riding. Now for something different! 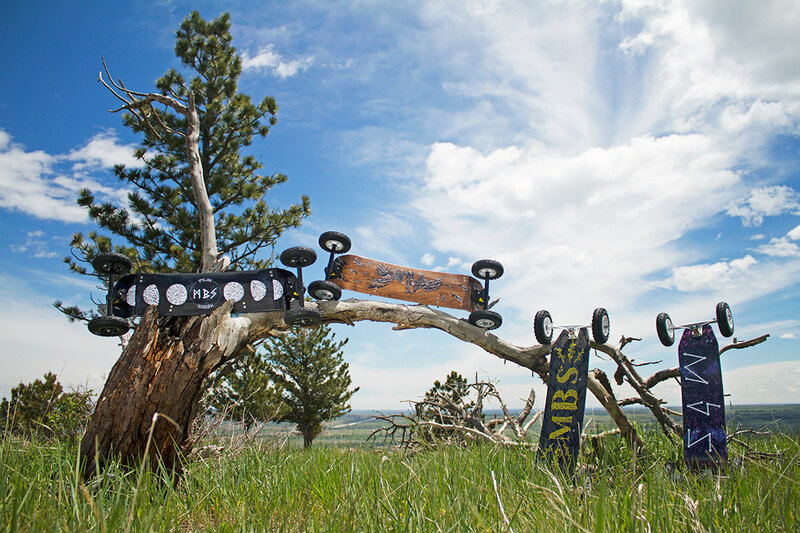 The All Terrain Longboard takes a classic 41″ Drop Down longboard deck, 190mm Navigator Drone trucks and our new 100mm all-terrain longboard wheels which are cast with super-high-rebound urethane. This beast does not care about loose stones on the road, it doesnt even need a road.